This month, we’re presenting the community with a weekly battle contest. 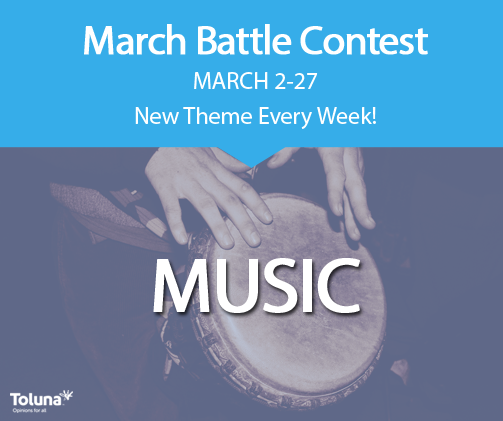 Each week we will post the theme for your battle, and in exchange you will earn 500 points. This contest will last all month, 4 themes in total, which means you can earn up to 2,000 points! – Create a battle with the title “MUSIC”; compare 2 artists, genres, decades, songs, etc. Login to your account today and start your battle! This is your last week so make it count! *Promotion Rules: Open to US and Canada only. Limit one battle created per person/per theme. Your battle’s title must begin with the weekly theme to be officially entered, contain an image or video, and must be created within 1 week of the blog posting. 500 points will be awarded to participants by April 8, 2015 and will be rewarded via rank up or uploaded directly to user’s accounts. Members can earn no more than 2,000 points with this contest. Posts must not contain any language or image that is obscene, insulting, threatening, abusive, harassing, defamatory, libelous, untrue, misleading or invasive of someone else’s privacy. Toluna reserves the right to review all posts for content, and withhold bonus points from any user violating the rules mentioned above. Violation of these rules, and/or theToluna Member Code of Conduct may result in the closure of your Toluna account.